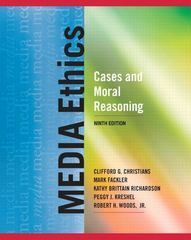 The Xavier University Newswire students can sell Media Ethics (ISBN# 0205029043) written by Jack Richards, Thomas Tutko, Clifford G. Christians, Mark Fackler, Kathy Brittain Richardson, Kathy Richardson, Peggy Kreshel, Peggy J. Kreshel, Robert H. Woods, Robert H Woods and receive a check, along with a free pre-paid shipping label. Once you have sent in Media Ethics (ISBN# 0205029043), your Xavier University Newswire textbook will be processed and your check will be sent out to you within a matter days. You can also sell other The Xavier University Newswire textbooks, published by Taylor &Francis Books Ltd and written by Jack Richards, Thomas Tutko, Clifford G. Christians, Mark Fackler, Kathy Brittain Richardson, Kathy Richardson, Peggy Kreshel, Peggy J. Kreshel, Robert H. Woods, Robert H Woods and receive checks.